What will it Cost Us? 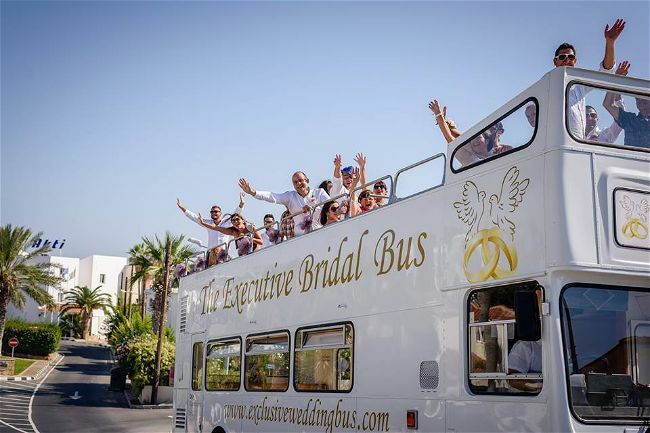 With a fleet ranging from traditional, under-stated elegance to the epitome of luxury…We can guarantee to provide you with the perfect setting on your wedding day! 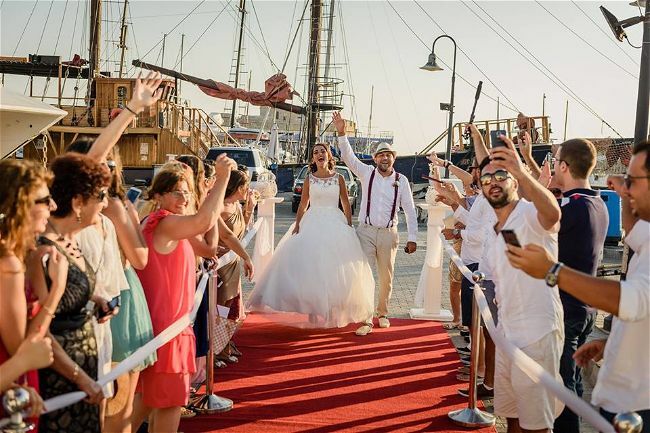 Imagine celebrating your wedding sailing on the crystal clear waters of the Mediterranean with your very own private chartered yacht. 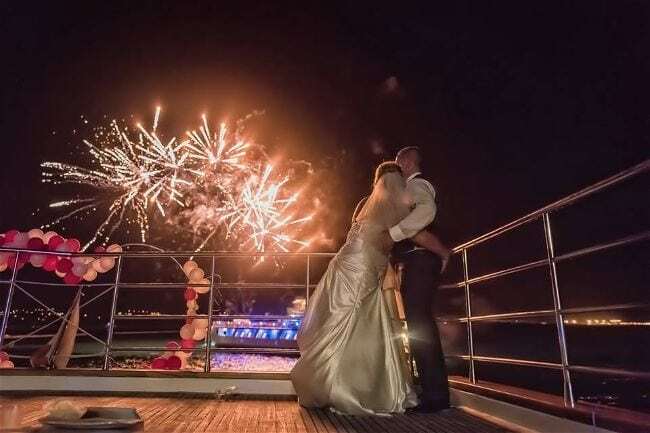 If you would like to do something truly unique and memorable for wedding day let then let Exclusive Yacht Weddings turn your dreams into reality. 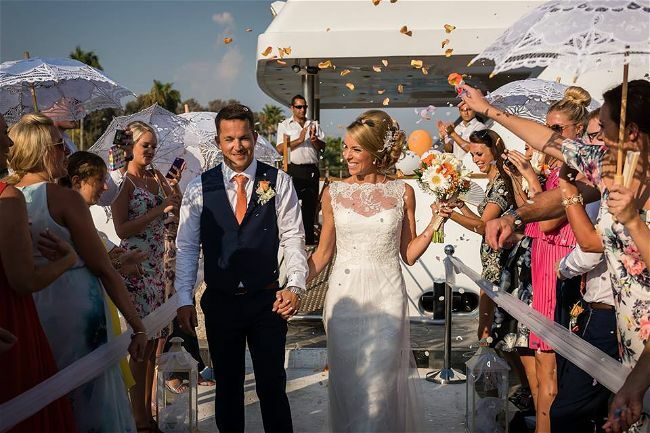 Based in Paphos and covering the whole island, Exclusive Yacht Weddings is managed by Sharron from the United Kingdom. 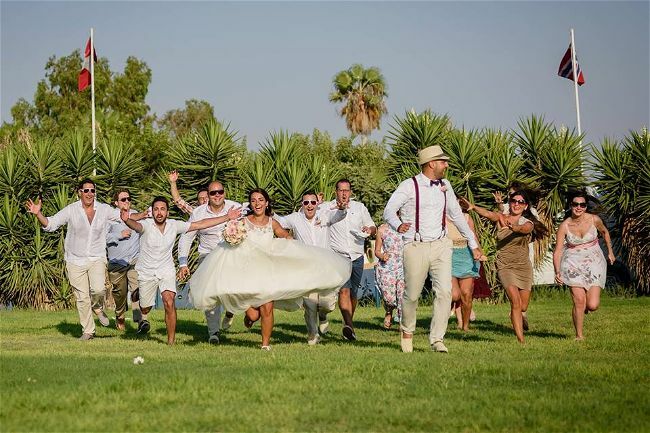 By combining English wedding tradition with local Cypriot hospitality and culture, Sharron will work with you to create a unique experience for both you and your guests. 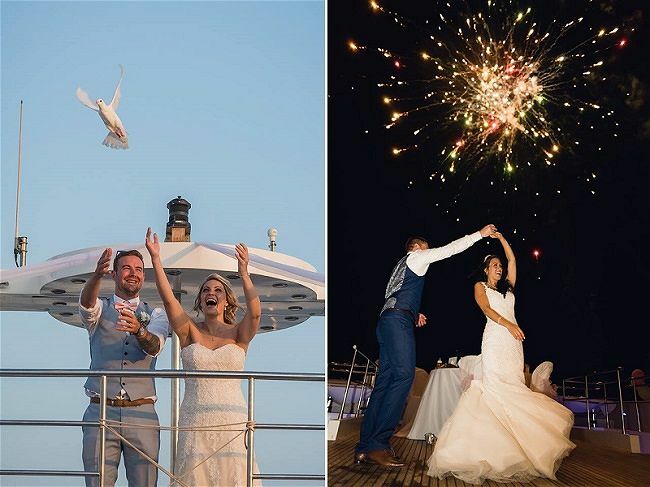 Certified members of UKAWP, Exclusive Yacht Weddings are specialists in Civil Wedding Ceremonies and Receptions. 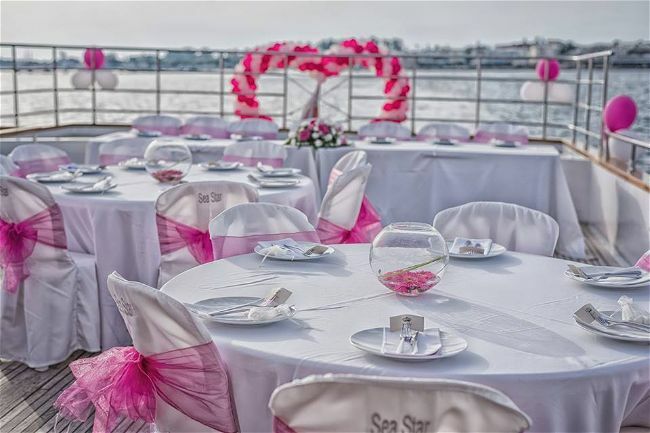 They have had 16 years of experience in Weddings with the backup of Masouras Bros Shipping Co Ltd and Ocean Flyer Ltd and have had 28 years experience in coastal cruises. 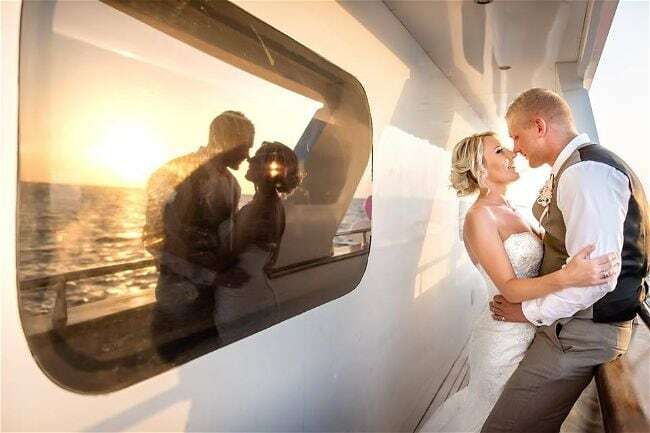 Exclusive Yacht Weddings’ specialists are professional and friendly and will be with you every step of the way. 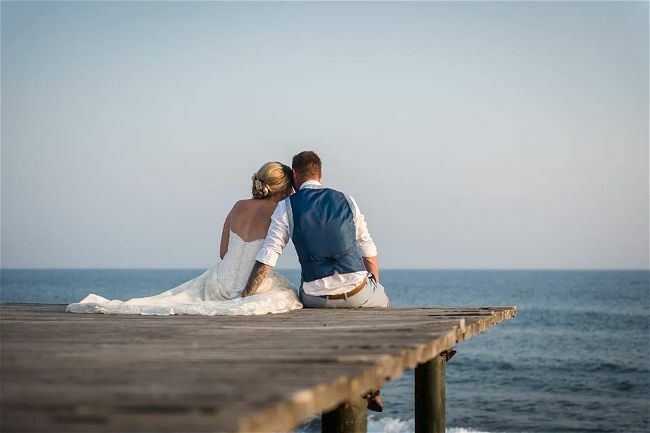 A pre-arranged appointment will be made for you and their wedding specialists will come to see you at your accommodation to confirm your paperwork and discuss the finer details and finishing touches, from then on it’s plain ‘sailing’…. 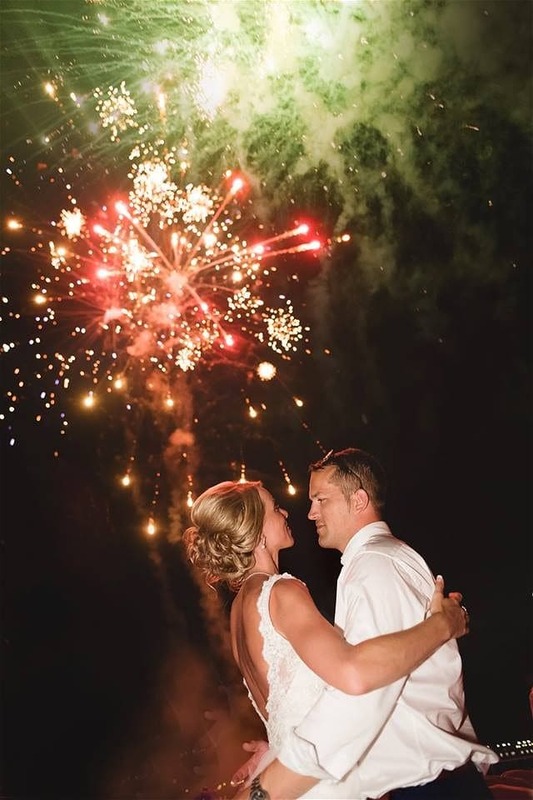 “Thank you all so very much for making our Wedding day so very special. The day was magical and one which will never leave our memories. 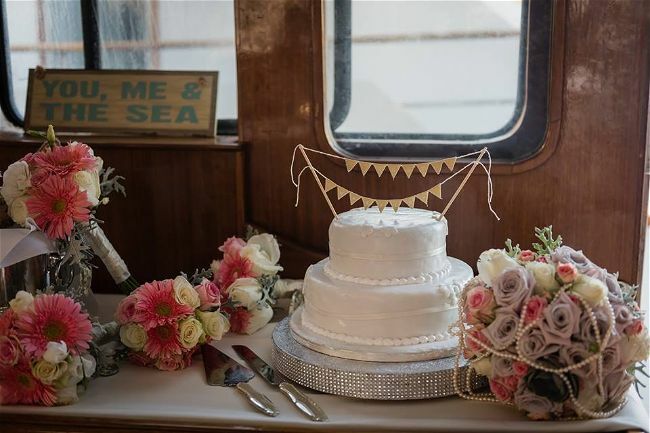 Your services were outstanding and every detail was perfect from the Wedding cake to the way the boat was decorated. 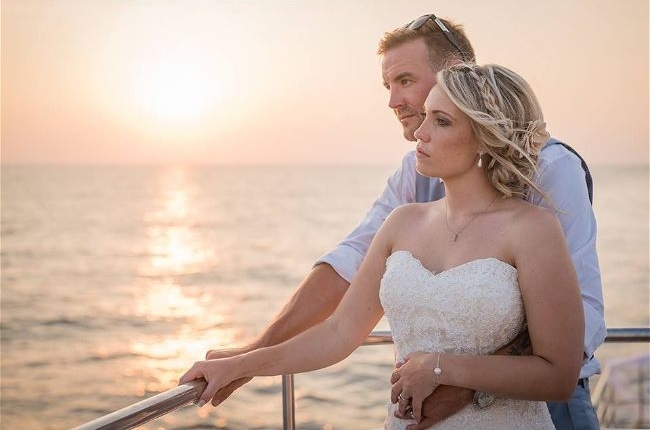 The boat was beautiful. 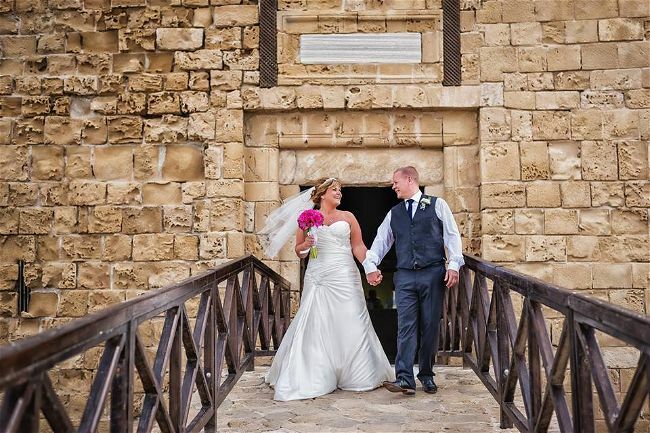 “Sorry for the delay in sending this email it has been so busy since we returned from Cyprus as Mr & Mrs 🙂 and we have been on cloud 9 ever since. We wanted to say a HUGE thank you to all at EYW that made our wedding day on the 30th of May the best day of our lives. 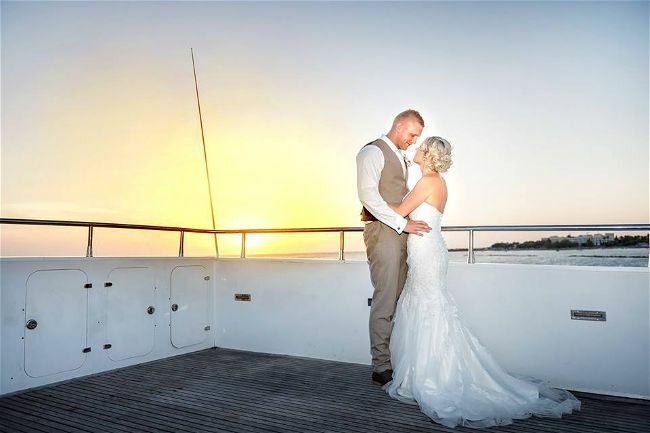 We truly had the best day ever and it exceeded ours and our guests expectations from start to finish it was simply a dream. The professionalism and attention to detail was spot on. Helen – What a lovely lady, so calming and friendly in her approach nothing was too much trouble for her. From our initial meeting to her support and organising on the day she was AMAZING! Especially as we bought soooo many ‘little’ and big extras out with us from the favours to the flower arch, aisle runner, wicker hearts, personalised water bottle stickers, dip dye sashes etc etc Helen and co ensured everything was set out to perfection! Thank you for organising all the last minute hair / eyelash treatments. The Town Hall and Ocean Flyer looked AMAZING! You were our wedding angel 🙂 THANK YOU. Lady with Helen (we are so sorry we didn’t catch your name in all the excitement) – Again what an angel on the day! Ensuring we were all ready on time and delivering the most beautiful flowers with Helen! We were so pleased with them. 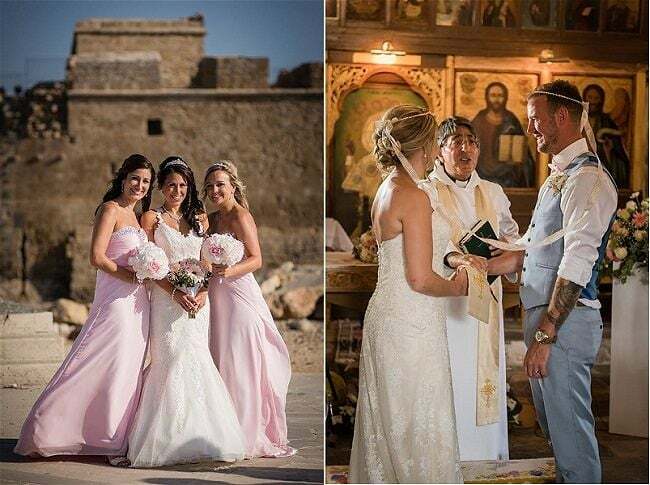 It’s all the little touches that were so wonderful and watching our DVD back you were the one chasing after me to fluff up my dress before I was about to walk down the aisle ensuring my dress was in place. I didn’t notice until we watched the DVD it was so sweet of you, very touching thank you. 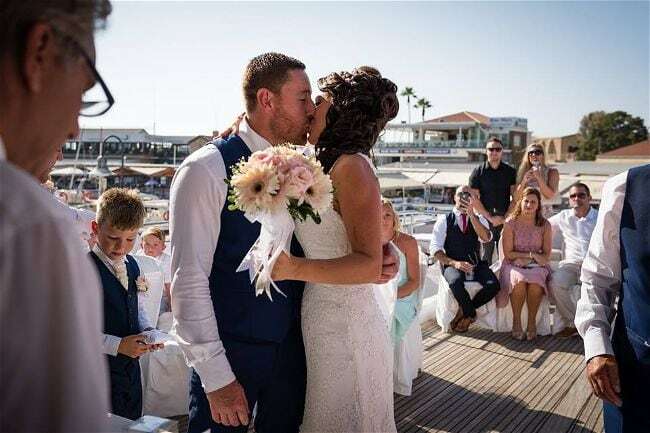 You were our secret wedding angel so discreet in approach and doing all the details in the background, it didn’t go unnoticed THANK YOU. 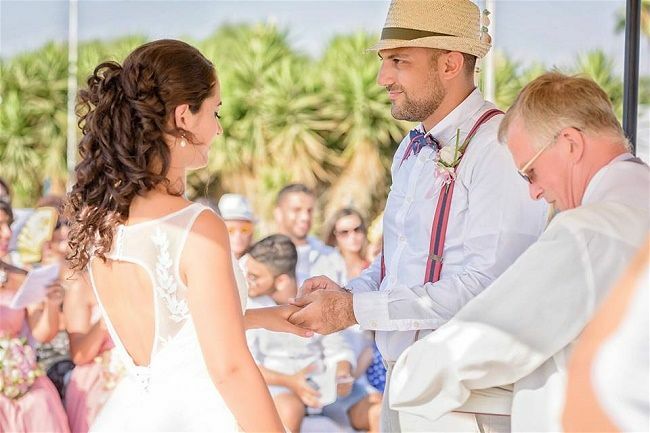 Sharron Masoura – What can we say… a true wedding fairy godmother! 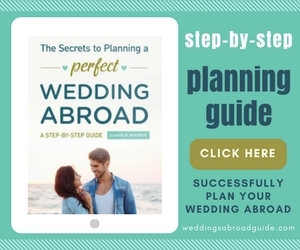 Putting us at ease from our initial meeting to our big day. Your organisation and attention to detail is spot on. You literally have thought of everything with the wedding package, completely hassle free allowing us to enjoy our day without a worry in the world. What a wonderful team of people you have THANK YOU. 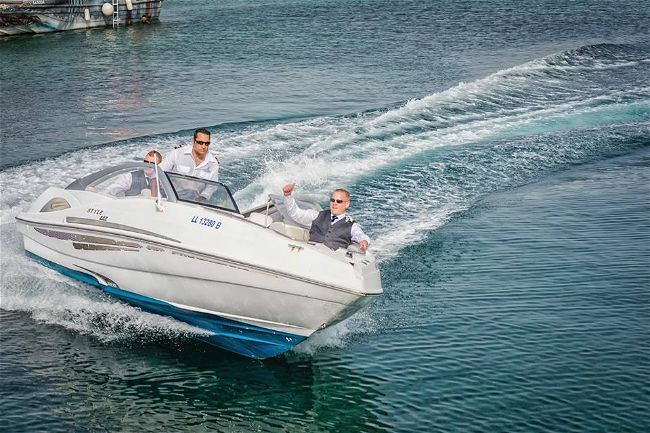 And of course the Captain and his Crew – What a blast they were, so professional, helpful and friendly they joined in with us too 😉 so down to earth and a great bunch of people. Apparently we were the first wedding party to jump in the sea for 5yrs and I was the first bride!! 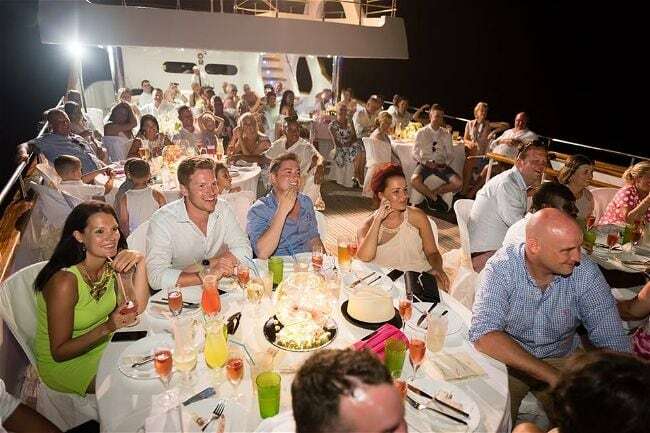 We had the best time on board and our guest enjoyed it as much as we did. Great food and drink and the crew went out of the way to ensure everyone had a good time paying special attention to our elderly guest by collected her food for her which was very thoughtful as she finds it difficult to walk. We had one guest that was sea sick and they looked after her very well indeed. Please do you have an email / address we can contact them on? We would like to say a personal thank you to them and we also have a few piccys too. They did us a special ‘ganam star’ dance at the end of the evening which was fab! A true credit to your company. THANK YOU. 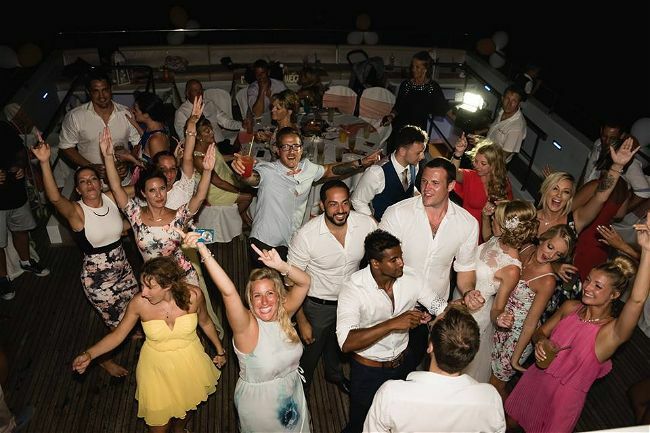 DJ – The music was fantastic! Great guy and entertained us brilliantly throughout the evening with little direction of the type of music we like he just knew what he was doing. A fantastic party had by all. 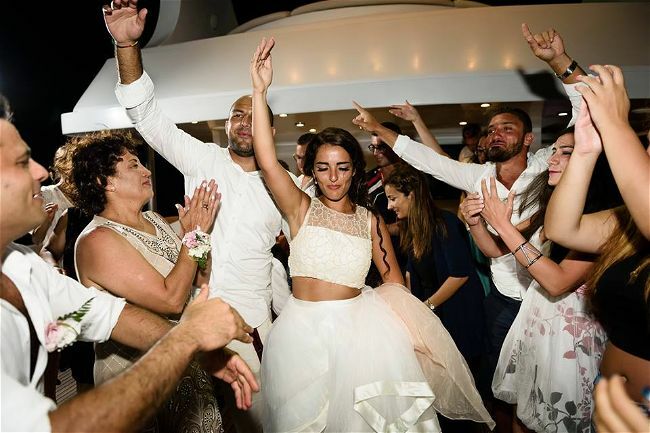 My mum made me laugh pre wedding as both families are fairly quiet and she was worried ‘no one would dance’ we told her not to worry everyone will just do whatever they like if they don’t want to dance that’s fine…. she was the first one up dancing and we did stop all night! Everyone had a great time and a great selection of music was played. 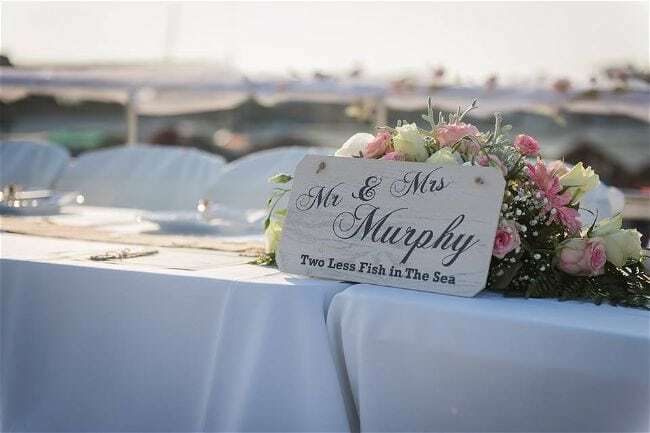 We would also like to thank Sharron Wratten for persuading us to book with EYW at the wedding fair all that time (not that we need much persuading) once she showed us the pictures of the Ocean Flyer and went through the package we were sold! Sharron was great, extremely helpful and friendly and not pushy making us feel relaxed and excited allowing time to make a discussion without feeling pressured at all. She really listened to what we were looking for and advised us how best to achieve it. 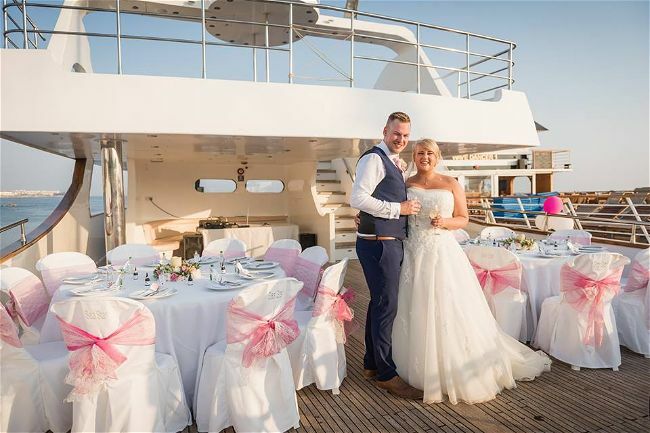 Exclusive Yacht Weddings says marrying in Cyprus on average costs one third of a UK wedding! 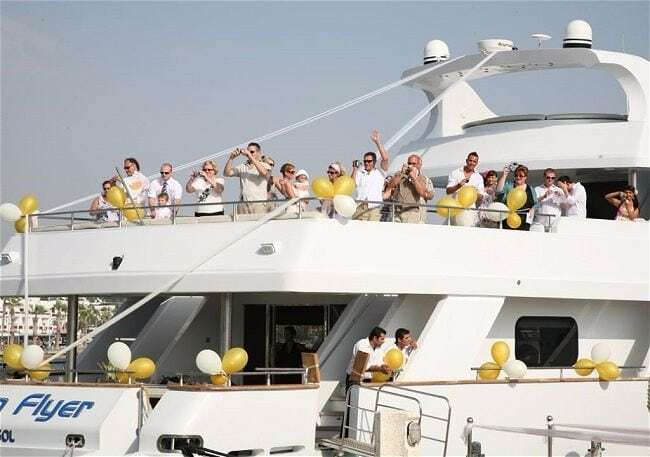 Yachts are private, unique and offer a fairytale setting – 7 days a week. 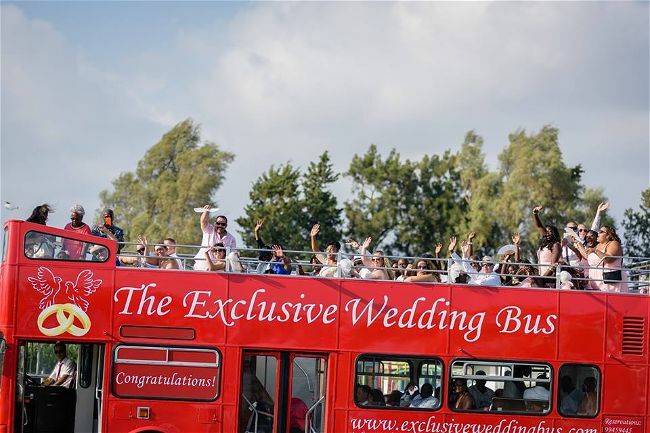 Book with us, you only need rings, dress and a suit! There are no special offers at this time but be sure to pop back and check. 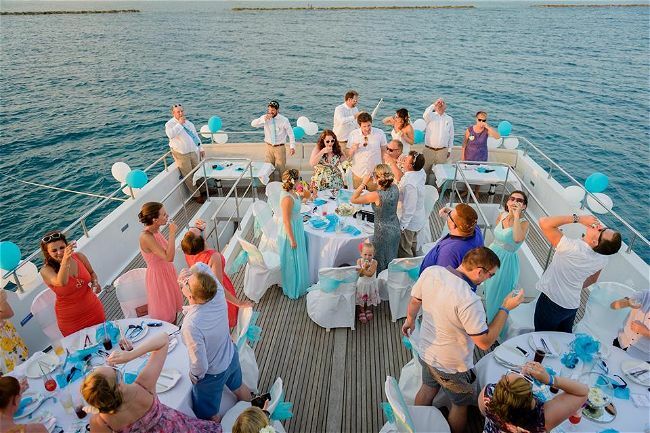 Based in Paphos but covering the whole of Cyprus, Exclusive Yacht Weddings specialise in beach and yacht weddings and offer a range of services to suit all budgets.